'He loved all mankind; for fortune prevented him from knowing there were rascals. 'Oliver Goldsmith's hugely successful novel of 1766 remained for generations one of the most highly regarded and beloved works of eighteenth-century fiction. It depicts the fall and rise of the Primrose family, presided over by the benevolent vicar, the narrator of a fairy-tale plot of impersonation and deception, the abduction of a beautiful heroine and the machinations of an aristocratic villain. 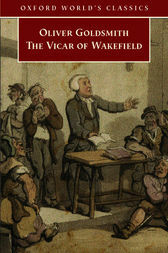 By turns comic and sentimental, the novel's popularity owes much to its recognizable depictionof domestic life and loving family relationships.Regarded by some as a straightforward and well-intentioned novel of sentiment, and by others as a satire on the very literary conventions and morality it seems to embody, The Vicar of Wakefield contains, in the figure of the vicar himself, one of the most harmlessly simply and unsophisticated yet also ironically complex narrators ever to appear in English fiction.ABOUT THE SERIES: For over 100 years Oxford World's Classics has made available the widest range of literature from around the globe. Each affordable volume reflects Oxford's commitment to scholarship, providing the most accurate text plus a wealth of other valuable features, including expert introductions by leading authorities, helpful notes to clarify the text, up-to-date bibliographies for further study, and much more.